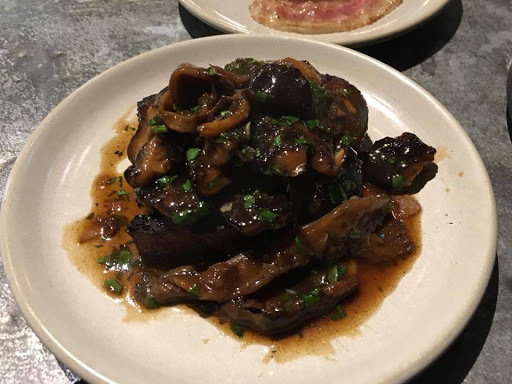 All aboard the Smokestak train! 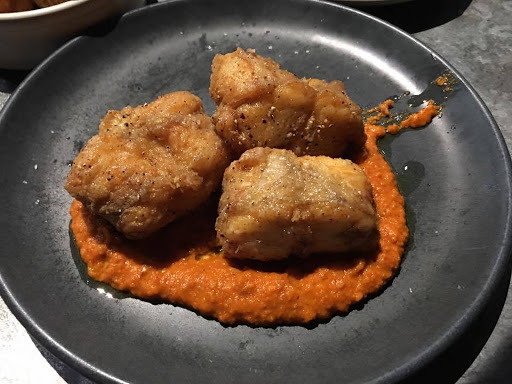 This juggernaut of a joint is fast becoming the King of Shoreditch by hitting the East End with its instantly recognisable industrial style open kitchen and restaurant but more importantly with its knockout food. 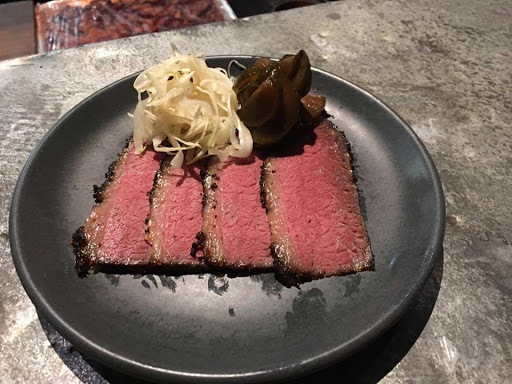 We sat inches away from the slicing, smoking and grilling of the behemoth cuts of meat and with all that right in front of our eyes we literally ordered the whole menu. And who could blame us as its one heck of an impressive place. 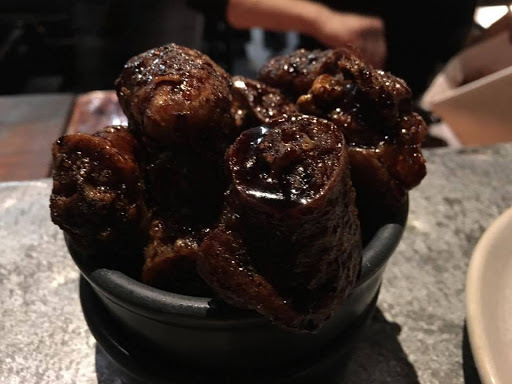 We started things off with nibbles including wafer thin, melt in your mouth cured pigs jowl, bite size pieces of crispy ox cheeks and my particular favourite sticky and crispy pig tails – seriously no need for pleasantries just get your chops round them. These guys don’t mess around with the food because in no time at all a whole load of small dishes came over straight from the chefs themselves with a soft buttery white roll packed with juicy beef brisket and a few punchy pickled red chillies, a stunning bit of pastrami accompanied with sour cabbage and pickles and finally a plate that knocks the daily calorie allowance straight out of the window- a thick slice of toast soaked in beef dripping, topped with a mountain of plump wild mushrooms. That boys and girls was just the start. We weren’t going to let anyone down, how could we because the food was just getting better and sexier by the minute. So who headlined the main event? 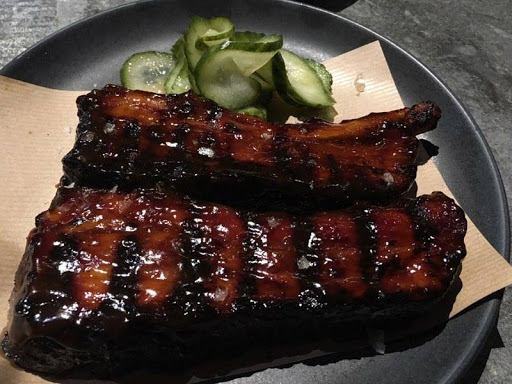 The thick-cut pork rib was to die for with perfectly aligned grill marks and a shiny sticky glaze on top (brushed on every minute whilst cooking) and it was that tender it just fell apart from the slightest nudge. 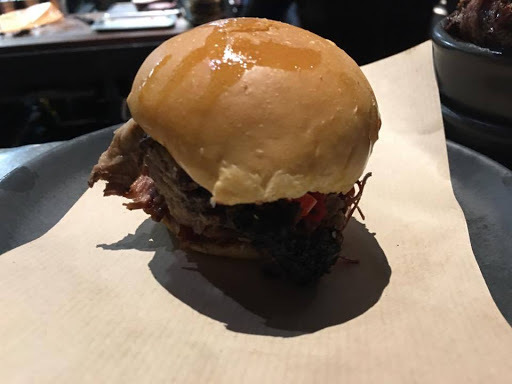 We also had shavings of beef brisket with the classic barbecue sauce and even more pickled red chillies (we like it hot!). 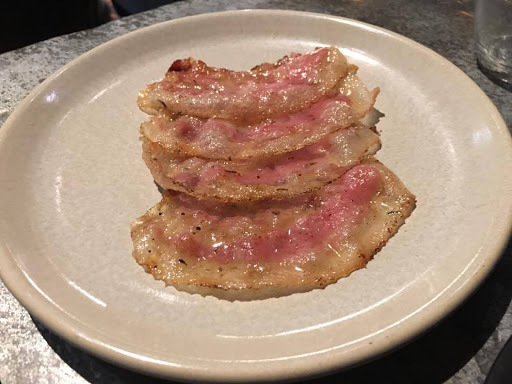 It’s not all meat, meat, meat at Smokestak, so before the moaning starts there’s plenty of alternative choices to satisfy others. 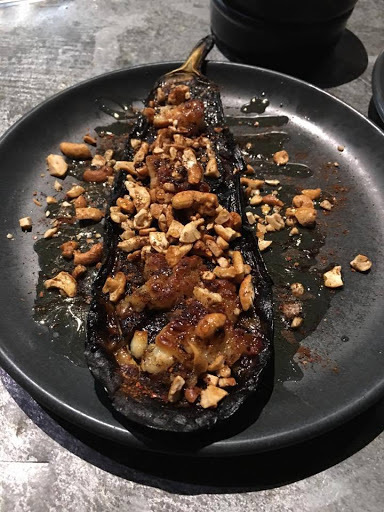 We went for the charred aubergines with crumbled goats cheese, burnt honey and toasted cashews as well as three chunky, meaty pieces of monkfish tail on a bed of romesco puree. If MTV created pimp my vegetables then Smokestak would lead the way. Take the humble potato for example. 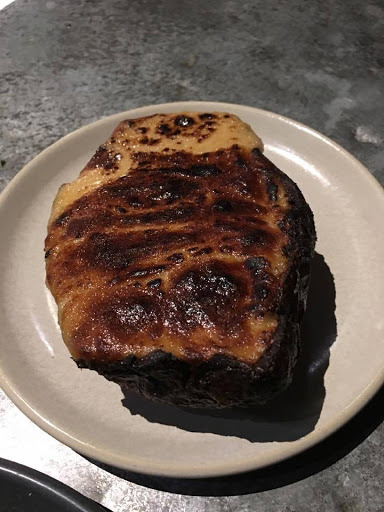 Here they scoop out the flesh, give it some love and affection and cram it back in it’s hard shell and top it with an excessive amount of gooey cheese. More drool came out of my mouth than Homer Simpson. 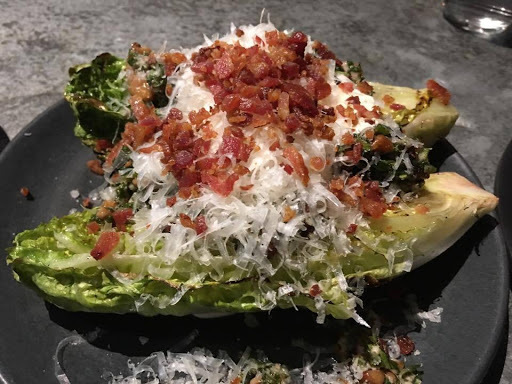 And it wasn’t just the jacket that got pimped, so too did the baby gem with a walnut gremolata, shaved parmesan and a handful of crispy bacon bits. 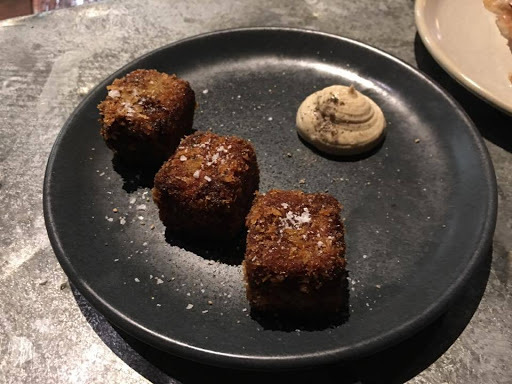 If it weren’t for the fact that we were sitting in front of the chef there was absolutely no chance we were having desserts but seeing her make a few and the fact I was having dinner with a pastry chef we just had to be that little bit more greedy. 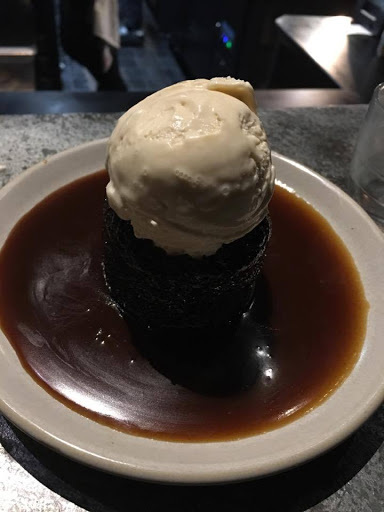 The sticky toffee pudding with burnt butter ice cream was the ultimate champion out of all them but that’s not to say the plum crumble was a weak dish because let’s face it sticky toffee pudding is a far superior option. 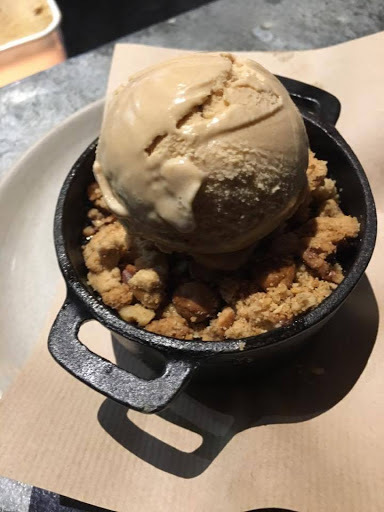 We also tried a little toasted oak ice cream and unfortunatley that was the weakest link to what was otherwise a successful evening. 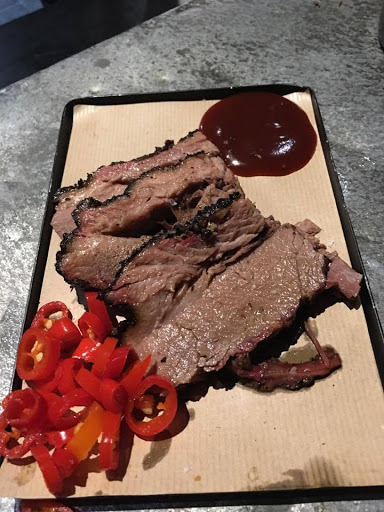 Smokestak has come a long way since I tried their menu a few years back at Street Feast. It certainly has come out all guns blazing… and to think they say smoking is bad for your health.